Far too often I find myself thinking, "This would be a great Instagram post opportunity." or, "Oh this will make for an excellent blog post." Now, there is nothing necessarily wrong with that, however, I shouldn't be living my life based on what will "look good" out in the social media world. REASON #1: Social media is essentially a highlight reel. Think about it, for the most part, anyone who posts anything out in social media is most likely posting the best of what they have. The best photo from their glorious vacation. The best part of their day. Their best selfie. What we don't see are the 35 other selfies that it took before they got that best one. We most likely won't see the worst parts about someone else's life. They won't be posting that. All we have to compare our lives to theirs are the best parts of their life, to everything we know about our own. This can easily make us become discouraged. Suddenly, everything that we have and everything that we are just isn't enough. When in reality, if we knew everything (not just the "highlights") about everyone we were comparing ourselves too, we would be far more satisfied with our own lives. REASON #2: We forget to live. How many times have you watched a spectacular firework show only to realize you were watching it through your tiny cell phone screen as to be sure to "capture the moment". Maybe that exact scenario has never happened to you. However, I'm sure there have been plenty of times where you have gotten so caught up in "capturing the moment" to be sure you can show everyone what a great life you have, and in doing so, you failed to simply live your great life. When was the last time you left your home without your trusty cell phone? (intentionally I might add...) How long can you go without scrolling through your "news feed" or checking your latest notifications? This summer I have tried to be more conscious of how "plugged in" I am to social media and how dependent I am on my cell phone. It's embarrassing for me to even admit that I used to not even want to go downstairs to get something to eat without taking my cell phone... you know... just in case I got an important text, or wanted to see what everyone else was eating for lunch based on their most recent Instagram post. I found myself turning to my cell phone in times of boredom, mindlessly scrolling away. Instead of immediately turing to your devices or using every opportunity possible to post your life on social media, GET OUT AND LIVE. Intentionally leave your cell phone at home when you run to the store. Sound a little scary? Trust me when I tell you, instead of being scary, it is liberating, even empowering. You have a beautiful life, but I'll bet you are losing sight of how wonderful it truly is because you are so consumed with watching everyone else's life unfold on Instagram. CHALLENGE: I challenge you to limit your social media time and work on leaving your cell phone behind. As you do so, watch to see if your happiness and even confidence increases. I'll bet that it does! 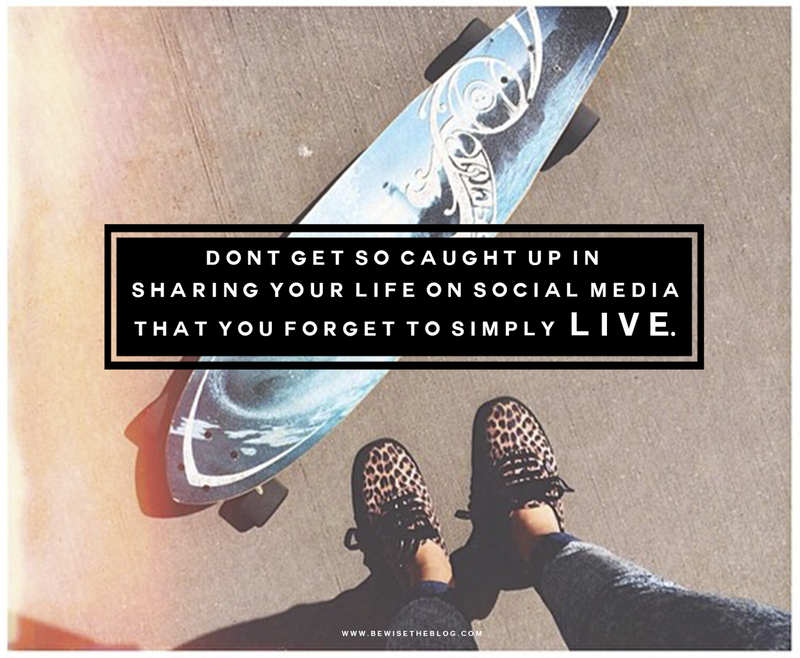 How do you balance your life with social media?